Blaine, Minn. (April 10, 2019) – Snow may be in the forecast this week, but that won’t deter the 45 teams playing in the 21st annual Stick-it to Cancer hockey tournament at the National Sports Center this weekend. After all, they are playing for a higher cause – finding a cure for breast cancer. The annual Stick It to Cancer hockey tournament, set for April 12-14, will draw both youth and adult female teams, as well as Co-Ed teams, to play for a championship, but more importantly, to raise funds to fight breast cancer. 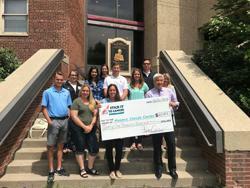 National Sports Center staff members make the presentation of $61,009 at the University of Minnesota Masonic Cancer Center after the 2018 tournament. Over the two decades the tournament has been held, a total of $870,732 has been donated to breast cancer research. For most of those years, the beneficiary has been the Masonic Cancer Center at the University of Minnesota, and this year’s donation will go to the same organization. Last year’s donation total was $61,009. Teams are encouraged to fund raise extra donations on their own, and many teams take up the challenge to win the fund raising race. Another unique aspect to the tournament is that the referees and supporting officials work for free, essentially donating their fees to increase the cancer donation. Each division at the Stick-it tournament comes with a story. 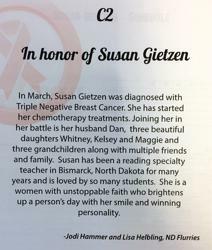 Here is the program page that tells the story of Susan Gietzen, honoree of the Women's C2 division. Several years ago, tournament organizers started naming the competition divisions after family and friends of players who had passed away from cancer, or successfully battled the disease. Honorees are nominated by participants in the tournament. Organizers of the tournament announced the names of the cancer victims and survivors who will be honored with their name on a competition division. The Stick It to Cancer Tournament also annually honors Jody Anderson, who is unique among the honorees. She was the original inspiration for the creation of the tournament, back in 1999. Her friend Nan McDonald wrote the following tribute to Jody, that explains how the tournament started. “Jody passed away in 2000, a Saturday morning before Easter. We started the Stick It to Cancer tournament the year before she died, in 1999, as a fundraiser for her battle. It was to support her family, as her treatment brought her down to Texas, a long way from family in Minnesota. “She attended (proudly bald and strong) and was so happy to see everyone playing and was surrounded by love and support. Her mom told me she was as happy as she was at her own wedding. “She fought hard to make it back for the second tournament but passed away about a week before. Jody’s son, R.J. Anderson, played hockey for the Gophers from 2005-2009. USA Olympic gold medalist Hannah Brandt skating during the Celebrity Game at the 2018 Stick-it tournament. Opening Ceremony on Saturday from 12:45 – 1:30 p.m., on rink 4, featuring a parade of teams. Special guests will be Dr. Heather Beckwith, an oncologist and Assistant Professor of Medicine at the Masonic Cancer Center; retired Minnesota Wild player Wes Walz, who has lost his mother-in-law to cancer; and tournament director Kathy Brodzinski. Celebrity players will be available for autographs immediately after the Celebrity Game. Bake Sale: Saturday, April 13, 8 am-4 pm. Silent Auction: Open during the tournament. Closes Saturday, April 13 at 8 pm. Raffle: Saturday, April 13 at 8 pm.